One and a half week till showdown – IBO champion Marco “Captain“ Huck fight at 1st of April with Mairis Briedis in Dortmund, Germany, for the WBC Cruiserweight title. 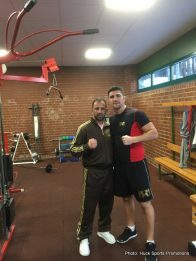 Huck worked very hard in the training camp in Braunlage, Niedersachsen, with his new trainer Oktay Urkal. The preparation with the former Olympic medalist was special because of Huck had broken the metacarpal bone in the last fight with Dmitro Kutcher in November 2016. But the injury is healed now and the bone is able to work under pressure. Former European welterweight champion Oktay Urkal is now responsible for training and fight preparation. Oktay Urkal was in the deacdes of the 90s and the noughties one of the enigmatic personalities of German boxing. Born in Berlin as a son of Turkish emigrants he became European Champion, German Champion and World Cup Champion as an amateur in Light welterweight. His biggest success was winning the Olympic silver medal 1996 in Atlanta. With his trainer Ulli Wegner he became three times European champion at the professionals, at last 2005 in welterweight. 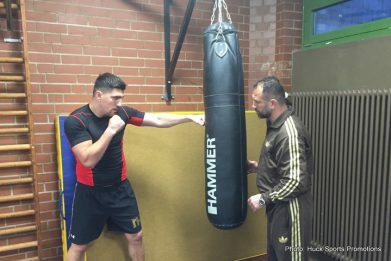 Urkal trains Huck currently in the training camp in Braunlage, Niedersachsen, Germany, for the title fight in Dortmund. IBO-World champion Marco Huck will fight on April 1st against the still unbeaten Latvian Mairis Briedis for the WBC-World championship in the Cruiserweight division. The unification fight for the IBO and WBC World titles will take place in Germany, Dortmund Westfalenhalle which provides place for 12.000 people that evening. RTL will broadcast the fight live. The unification fight for the belts of the IBO and WBC became feasible due to the transition of the actual WBC-World Champion Tony Bellew from the Cruiserweight to the Heavyweight division; where the English Tony Bellew will fight his fellow countryman David Haye on March, 4th in London. Since Tony Bellew is not available to defend his title due to the division change, the WBC called for the Championship fight between the WBC-ranked 1st Mairis Briedis and Marco Huck, who is ranked 2nd by the WBC. Just like Bellew, the winner of this fight will be listed as World Champion by the WBC with the commitment that both champions have to fight the title out in a decisive match. If Bellew decides to stay in the heavyweight division or to not fight against the winner of Briedis-Huck, the winner of Briedis-Huck would become the unanimous world champion of the WBC. Marco Huck (32) has got a record of 44 professional fights, out of which 40 times he came out as the winner (27 K.o., 3 losses, 1 draw). On November 19th 2016 he defended his IBO-title by an unanimous decision of the judges against the Ukrainian Dmytro Kutscher – even though he suffered a fracture of the right middle hand bones. As the doctors gave Huck green light in the past week he is in rehabilitation training at the moment. The WBC is regarded as the biggest association in boxing, the green-golden belt is viewed as the most prestigious amongst the fighters. The last WBC-World-Champion, who regularly had his world-championship fights in Germany, was Vitali Klitschko.